The House of Switzerland is a mobile building that serves as the official visitors’ center for Switzerland at major international events. Following its debut at the 2014 Winter Olympics in Sochi, the building went on to serve events in Zurich, Milan, and Rio de Janeiro. This book takes a close look at the architectural and design challenges presented by a building that has to be mobile, accessible, and visually striking. Drawing on materials from the planning process conducted by Switzerland’s Federal Department of Foreign Affairs and the architectural firm Spillmann Echsle Architects, which built the house together with Ortreport scenographers, the book presents a dictionary of all elements in the building set for the house, illustrated with images and plans rendered with rich technical detail. A discussion between the key figures involved in the project rounds out the book, exploring the process of creating such an iconic representation of a nation abroad. 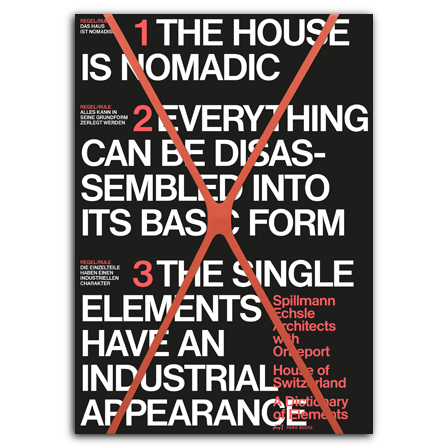 With contributions by Annette Spillmann and Harald Echsle, Nicolas Bideau, Alex Hanimann, Max Küng, Hannes Nussbaumer, Gudrun Sachse, Philip Ursprung, Christoph Wieser, and Gunda Zeeb, and a conversation between Annette Spillmann and Harald Echsle, Nicolas Bideau and Christoph Wieser.